I started by thinking I would use my regular hummus recipe and sub 1/2 cup green peas for chickpeas. Then I was not sure about the tahini or garlic. So I went into the field, aka the Le Pain up the street, and did some research. I ordered the green pea hummus plate and it turns out the hummus is very light, no garlic or lemon. The sides were plain and the perfect accompaniment. I squeezed the fresh lemon over the top of the plate and seasoned it with salt and pepper. When the bill came, so did the recipe for the green pea hummus. So today, I made the hummus and the rest of the plate for lunch. Truth is, homemade is better! Place all ingredients into the processor and and blend. * Original recipe called for only 1 cup of peas and no water. I added more peas and added some water to get a consistency I like. I have used both tahini and cashew butter and I like cashew butter better but that is just my personal taste. Garlic is optional. I have also used both fresh and frozen peas and the frozen peas make the hummus just a bit sweeter and smoother. I think the frozen peas win! Using a vegetable peeler, peel the outer skin of the zucchini and carrot. Continue to peel until you have a heap of shaved vegetables. 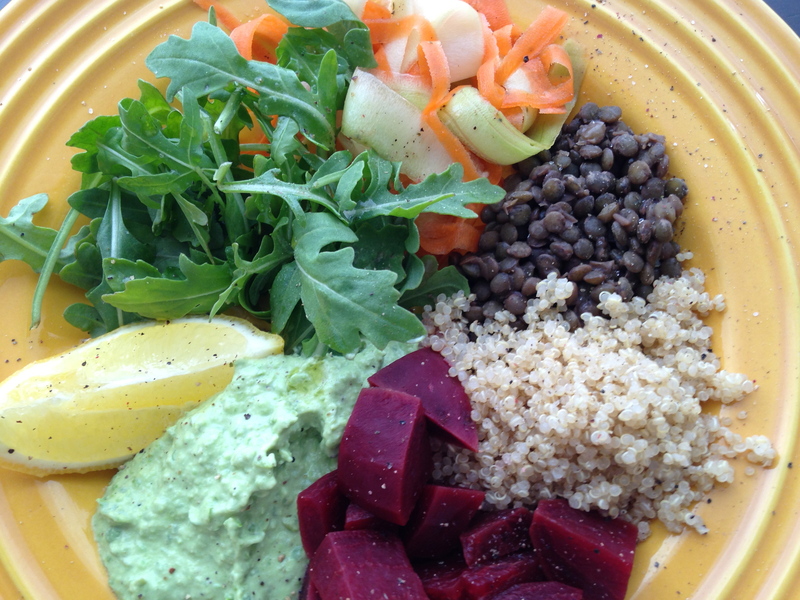 Arrange the plate with a big spoonful each of green pea hummus, lentils, quinoa and roasted beets. Add a handful of arugula and dress with a touch of olive oil. Add a pile of shaved vegetables and a lemon wedge. Season with salt and pepper. Enjoy! Definitely going to try this pea hummus, thanks for sharing!